Karen (aka DJ Shy) loves her boyfriend Mickey, sometimes. But when alcohol is involved, a monster seems to take his place. His moods swing from super sweet to completely offensive and you don’t know which personality shows up. DJ Shy struggles to handle Mickey’s Jekyll and Hyde behavior that threatens to jeopardize both their relationship and her career. Can they get past their issues to make these relationships work? Have you heard from Mickey? If so, how did it go? Yes, Mickey would text and call sporadically. I usually ignore him, but he would always say something to get a response from me. I’m not sure of his motive for contacting me, but I did let him know that I’m happier now, and wish him well. How will your relationship with Mickey affect your future relationships? Did dating Mickey help you solidify what you want and don’t want in a boyfriend? I know what I don’t want in a relationship. I don’t want to date a guy who drinks, smokes or does drugs. It’s a definite red flag. How is your relationship with your new manager? Are you happy you found new management? Bucky is great. He is very professional and looks out for my best interest. It feels like a heavy weight has been lifted off my shoulders. I can now focus on work without stress or liability of having to worry about another person and how he reflects on me. What was it like sharing your story with us? Sharing my story was a bit of a roller coaster ride. There were good times as well as lots of bad times, but it was definitely thrilling. The show made me realize there needs to be stability in my life, and I’m glad I was able to walk away without any regrets. This entry was posted in music, tv on August 2, 2013 by Kevin Hsieh - channel APA. Stuntman Steven Ho attempts to train Conan O’Brien to become the next action hero. First, Steven toughens up Conan with a few whacks of a paddle. Next, Conan channels his inner Ninja Turtle Michelangelo and cranks up his intensity. Hero pose and grace are part of the training before Conan gets straight into the action. Adding to his action hero image, Conan gets the addition of a weapon, the nunchucks. With weapon in hand, our action hero is attacked by lethal gang. Will he save the day? Steven played Donatello in the Teenage Mutant Ninja Turtle movies, and dubs Conan the new Michelangelo. We’re not sure what kind of thugs would brandish a baked potato, but Conan & Steven are prepared for them. This entry was posted in comedy, tv on July 26, 2013 by Kevin Hsieh - channel APA. Comedian Kumail Nanjiani made an appearance on Conan to promote his show “Franklin & Bash”. He chats with Conan about this recent visit to Comic-con and his unusual experience in the bathroom. Also he shares his cultural experience at birthdays in Pakistan and his transition to life in America. They’re a staple at Pakistani birthdays. Just don’t think about how their training works. This entry was posted in comedy, tv on July 24, 2013 by Kevin Hsieh - channel APA. Olivia Munn made a guest appearance on Conan to promote Season 2 of The Newsroom. While on the show, she talked about staying fit by getting a trainer. However, once she started working out, her body started storing up fat like it was the zombie apocalypse. Olivia also talked about growing up with her Tiger Mom. As young girls, Olivia and her sister would try to outsmart their mother, but that only increased their mom’s vengeful wrath. This entry was posted in comedy, tv on July 21, 2013 by Kevin Hsieh - channel APA. 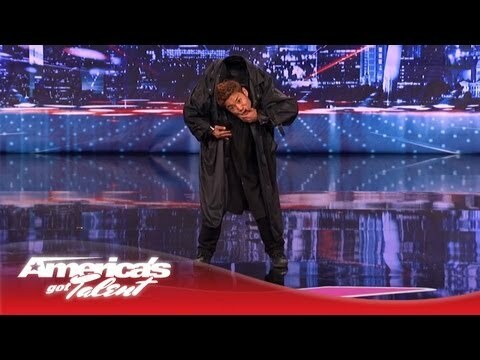 If you missed this episode of America’s Got Talent Season 8, you missed an amazing performance by Kenichi Ebina. You’ve never seen dancing done like this! From his head fall to his Matrix-style moves, Kenichi Ebina will blow your mind! Get ready for his dance-ish performance. You’ve never seen anything like this. He gets a round of approval from the judges. This entry was posted in dance, tv on June 20, 2013 by Kevin Hsieh - channel APA. Time to Gleek out! and Learn 10 Rules to Finding Inspiration, Happiness, and the Real You from Glee’s Jenna Ushkowitz. She inspires fans to invoke positive thinking into everything they do. Fans of the breakout musical series will flock to Ushkowitz’s heartfelt and practical guide on how to be your true self, gain self-esteem, and find your inner confidence. In Choosing Glee, Jenna shares her life in thrall to performance, navigating the pendulum swing of rejection and success, and the lessons she learned along the way. Included are her vivid anecdotes of everything before and after Glee: her being adopted from South Korea; her early appearances in commercials and on Sesame Street; her first Broadway role in The King and I; landing the part of Tina on Glee; her long-time friendships with Lea Michele (a.k.a. Rachel Berry) and Kevin McHale (a.k.a. Artie); and touring the world singing the show’s hits to stadium crowds. Peppered throughout are photos, keepsakes, lists, and charts that illustrate Jenna’s life and the choices she has made that have shaped her positive outlook. Choosing Glee will speak to the show’s demographic who are often coping with the very stresses and anxieties the teenage characters on Glee face. Think The Happiness Project for a younger generation: With its uplifting message and intimate format, teens can learn how, exactly, to choose glee. Jenna Ushkowitz plays Tina on the huge FOX hit, Glee. She started her acting career at the age of three and made her first appearance on Broadway’s The King and I at the age of nine. Jenna returned to Broadway for Spring Awakening and has been on Glee since the show’s inception. This entry was posted in book, tv on June 19, 2013 by Kevin Hsieh - channel APA.